The Catholic Church of Vermont is dedicated to the safety and well-being of all children and vulnerable adults. The Church strives to uphold the dignity of all children and vulnerable adults and is committed to providing a safe environment for them in all Catholic schools, parishes, camps, events and faith-based programs. Under the guidance and direction of the United States Conference of Catholic Bishops and the Secretariat of Child and Youth Protection, the Diocese of Burlington works alongside other Dioceses and Eparchies in the nation to ensure that the Catholic Church in the United States adheres to a zero-tolerance policy when it comes to child abuse and neglect. To learn more about the national efforts to prevent child abuse, read about the Charter for the Protection of Children and Young People. 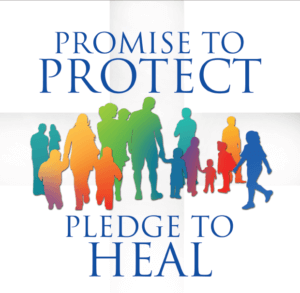 Through our collective work throughout the country, Catholics strive to fulfill our sacred “Promise to Protect” the children entrusted to our care and our “Pledge to Heal” those who have experienced abuse by clerics or other Church personnel. Learn about what the Diocese of Burlington is doing to fulfill our “Promise to Protect” by visiting our Policies Page. Learn about how the Diocese of Burlington is striving to fulfill our “Pledge to Heal” by visiting the Healing and Support Page. Child safety is everyone’s responsibility. Everyone in the Catholic community has a vital role to play in safeguarding children from abuse. One person has the power to make a difference in a child’s life by being informed about the signs of abuse and by knowing how to make a report to the proper authorities. The Catholic community is safer due to the thousands of adults throughout the Diocese who took the time to complete child safety training and submit a background check before serving youth in their ministries. Enroll in one of our Educational Programs. Thank you for working alongside the Office of Safe Environment Programs to protect all children and vulnerable adults entrusted to our care.